What is the Relationship Between an Individual and a Community? What is the relationship between and individual and a community? A community is a group of people who have, “A common feeling of fellowship with others, as a result of sharing common attitudes, interests, and goals.” And an individual is someone who, “Is not part of a group because of their own goals or interests.” In The Scarlet Letter, the idea of and individual vs. community comes up multiple times throughout the story. Hester is seen as the individual who has to try to survive against the rest of the colonists, a community, who use her when needed, otherwise they throw her away as an outcast. For an individual to help a group, they have to think about how they can accomplish their own goals while still improving the community as a whole. History shows that it has always been hard for an individual to live a good and faithful life without becoming part of a community. In The Scarlet Letter, the community is the colonists that live with Hester. Hester is the lone individual who is secluded from society. The community only gives attention to Hester when they need her amazing sowing skills. He talent of being an amazing seamstress was used for funerals, babies, and fashion. In chapter 5 of the book, Hester’s: “Handiwork became what would now be termed the fashion. Whether from commiseration for a woman of so miserable a destiny; or from the morbid curiosity that gives a fictitious value even to common or worthless things…” The community didn’t care about her sin when they needed he talent for their benefit. But once they received what they needed, they again shunned her from their community. This shows the relationship between the community and the individual in The Scarlet Letter; there was only a one way benefit that supported the community and never the lone individual. And the community didn’t think to care that this was they only way Hester was surviving and making money, while they all had businesses and each other as support in case something horrible happens and one of them goes broke or something. Also, the individual, Hester is never allowed to participate in a joyous occasion for the community. As Hester’s’ products and, “Skill was never called in to embroider the white veil which was to cover the pure blushes of a bride.” This is when they all remember Hester’s sin and decide to bring their society back together. Hester Prynne has no benefits as being the individual in this individual vs. community relationship. Why Are We So Obsessed With Material Happiness? Different people perceive happiness in different ways across the entire universe. The generation in which my parents grew up was one where kids were taught that happiness was acquired through making an overwhelming amount of money and being able to buy anything you want. I have now come to realize that this is only one perception on the topic of happiness. Some people see happiness as a very materialistic thing, while others see it as something spiritual and optimistic for what they have. A common theme relating to happiness that has carried over to today is materialistic happiness. As described by a famous French philosopher, Jean Baudrillard, the consumerist choice is expounded by the symbolic of something, not as much the price of this object. And in today’s case this symbol is happiness. When a consumer pays attention to the symbolic side of a material, they are willing to pay as much as ten times the normal price. 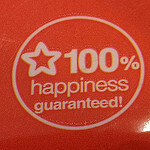 Current businesses use this idea and advertise how their product can bring happiness to people. A materialistic person is never satisfied; the feeling of happiness is only a temporary one. A person who looks to materials or objects for happiness tends not to care about the happiness of family. People who have a materialistic approach to happiness are generally seen as self-centered. These people focus on trying to waste their money on products that bring them a short-term satisfaction. This is not an approach that society should teach to its youth.